The hole crept up on me. It was on the bottom of the sock's heel, where I didn't notice it getting worn, until one day I wore the socks and noticed there was a giant hole on the bottom. They're not the best socks in the world; worked with regular worsted weight yarn, they were not going to wear well. Still, I was determined to fix it and get a little more use out of it. 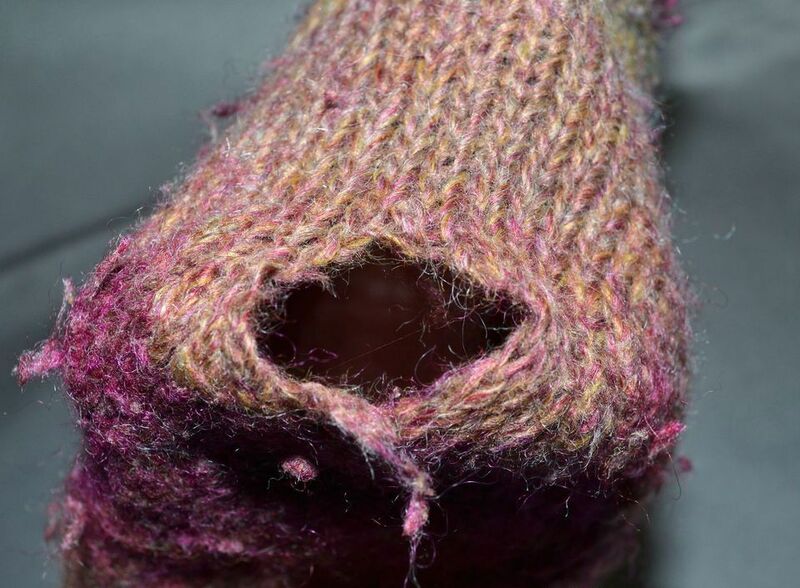 Darning is the traditional method by which holes and worn spots in socks are mended, and you can do it on handknit socks or purchased socks, as shown in Rain's tutorial linked here. But I wanted to try what I thought would be an easier method for mending a knit sock by knitting a flap of new knitting to cover the hole, attaching it at the sides as I went. I will say this might not be a perfect method, mostly because the three-needle like bind off I did at the end makes a seam that is bumpy and could be uncomfortable (I'll mention alternatives when we get to that part). But it worked for me to get some more wear out of these fun and cozy socks (if you want to know, they are the Mommy & Me Socks from my book Quick and Easy Baby Knits). To get started you'll need your holey sock, yarn to match (or not, as you like, but the same weight at least) and two knitting needles of the same size as you used to knit the rest of the sock. I decided to work my patch from the top down because that's how the sock was initially worked. I used one needle to pick up and knit 7 stitches. This gave me a stitch or two on each side of the hole as well as the full width of the hole. It happened that one of the loose stitches was visible on this side so I picked up that stitch as I went along; otherwise I just worked into the fabric that remained. The number of stitches you need to pick up will vary depending on how big the hole is. Once you have your stitches picked up, turn the work and purl across. Knit across, then pick up a stitch on the other side to work together with the last stitch of the row as well. This anchors the flap to the sock and eliminates the need for seaming later. I was tempted to work something like an ssk at the end of the row, but a k2tog looked better, even though slipping the stitches around is a bit more work this way. I should also note that I say knit on right side rows and purl on wrong side rows because my sock is Stockinette Stitch. If you're fixing part of a heel flap or another portion of a sock worked in a different stitch pattern, work in whatever matter you need to in order to make it blend in as best you can. Continue in this manner, anchoring the right side rows and working across the wrong side rows, until you have worked up past the edge of the hole, ending with a wrong side row. I finished my sock mending flap with a sort-of three-needle bind off, by which I mean I picked up a stitch in the knit fabric, worked it together with the stitch on the needle and then bound off as I went (but there was no actual third needle involved). I like this method because it is easy and leaves you no finishing other than weaving in the ends when you are done, but it is bulky and might feel uncomfortable on your foot or in a shoe depending on where it lands. I have worn my sock since the fix and it doesn't actually bother me. If you don't want the bulk of that bind off in your mending flap, you could bind off in a regular way and sew the flap down in a more traditional way. You might also explore stitching it down with duplicate stitch worked over that last row of knitting, but by then you'd have three layers of stitching (the original sock, the flap, and the duplicate stitching) so you're not losing any bulk that way. In the future, if you find your socks are wearing in the same place, you can work reinforcing nylon thread (often sold at yarn stores) along with your sock yarn as you knit in whatever places tend to wear for you. Also, make sure you're using the best yarn for socks.